Hemen zaude: Sarrera » Albisteak » Bernardo Atxaga involved in the filming of "Soinujolearen semea"
Bernardo Atxaga involved in the filming of "Soinujolearen semea"
The film, which is based on Bernardo Atxaga's novel of the same title, The Accordionist's Son, is being filmed on location in San Sebastián. Directed by Fernando Bernues, the film features the actors Eneko Sagardoy, Joseba Apaolaza and Mireia Gabilondo. The Accordionist's Son is one of Bernardo Atxaga's best known works. It was first published in English by The Harvill Press in 2008, following its original publication in Basque by Pamiela in 2003 and being very well received. It has been translated into 15 languages, and in 2012 it was brought to the stage. Now it’s on its way to the big screen. Filming began several weeks ago, and the last few days of filming have taken place in San Sebastian. 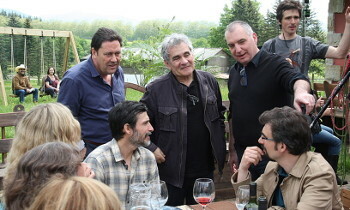 Eneko Sagardoy, Aitor Beltran, Iñaki Rikarte, Joseba Apaolaza, Mireia Gabilondo, Frida Palsson and Miren Arrieta make up the main cast of the film, which is being directed by Fernando Bernues. This is not the first of Atxaga's novels to be brought to life in cinemas, but this time is different as the author has been involved in various phases of the project, as he explained in an interview given to the Basque language newspaper Berria. "The book is pure thought, it isn’t something that’s observed. The writer doesn't have a movie in mind. The book and the film are two completely different worlds. I think the finished film will make a great impression on me." The movie has been filming for five weeks. After filming in Ultzama, Irun and San Sebastián, the production will soon change location and move to Bera and Lesaka in search of the landscapes that represent the fictitious town of Obaba. "Filming will end this month. We hope to have the film completed by October so it can debut in January," noted director Fernando Bernues.